Can you attach it to the interior of the pocket door frame? No Desert, this is not a typical pocket door installation. It’s framed out using steel square tubing. The contractor re-did it twice using typical wood framing before switching to steel and won’t let me touch it. Regardles, it is fine construction! Looks really nice jbay. At 9’ tall do they go right up to the ceiling? I like the doubled shelves, gives them a nice substantial look. Yes, they will be going to the ceiling. I’m going out to the house with a template to scribe the ceiling, then bring the template back to the shop and transfer to the cabinets. That way I can make the cuts in the shop. Then when I install I won’t be dragging heavy cabinets in and out of the house to fit them. Desert, they are built using maple hardwood and plywood. Unit will be painted black to match the Sliding pocket door that will be next to it. 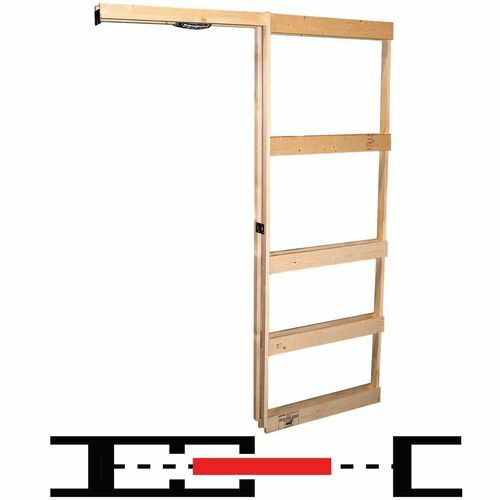 All of the shelf heights match the rails on each panel of the pocket door. Let’s talk about the span, of each carcass- aprox. 30-36” in length? If so, it appears that you have made a “glue-lam” beam of a shelf to span this distance. Genius, if it can carry the weight load of a span over 30”, if so how many pounds, before it “bows”? What I don’t see is- how do you, attach the face frame to the shelf, or not? It should hold whatever is going to be put on them. I don’t know how many lbs. The front has the solid piece of maple applied to it and they will all be screwed to the back as well. The shelves won’t be attached to the face frame. Here is the sagulator specs. (without the shelves screwed to the back) and if I did it right. Those shelves are solid- I hope that you post more of this type of information. You include the drawings and tech data. 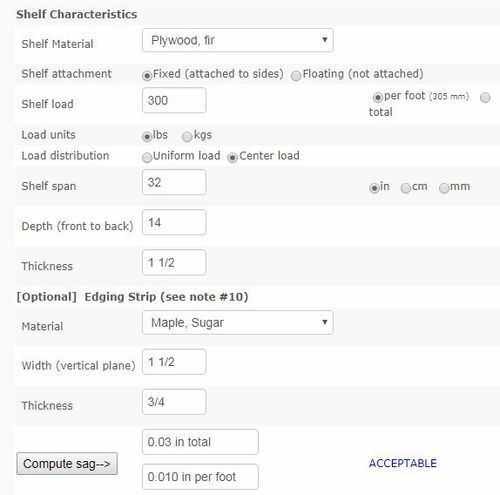 As an aside :) Why “sugar maple” ? I thought that Alder was the rage on Lumber Jocks …. You can attach it to the back wall above the door—there is a header there and studs beyond the door pocket. This is a custom home. The pocket door is 7’ wide and goes all the way up to the ceiling. No header or studs. The framing for the pocket door is steel square tubing and the contractor is not going to let me screw into it. Alder IS all the rage, I love it! But Maple was the better choice here. They are paying for higher quality. Heck, I could have used mdf and poplar and it would have looked just the same. 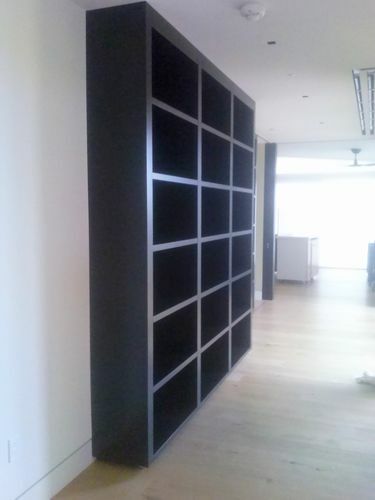 Here is the finished bookshelf – installed. 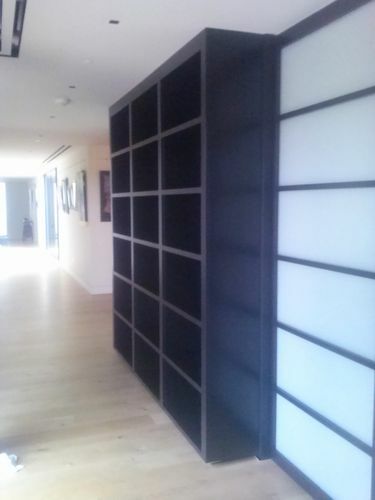 is the full floor to ceiling pocket door. Thus the reason I could not screw into the back wall. Unit was screwed to ceiling and glued to a platform with adhesive and shims, then covered with a 1 3/4 high kick.